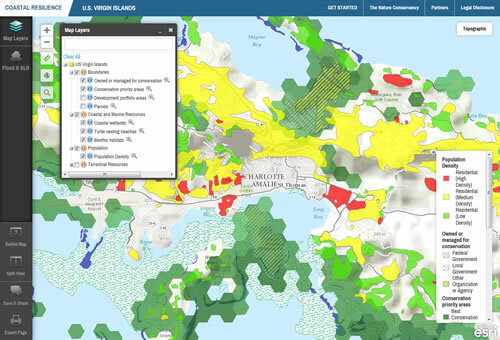 The Nature Conservancy uses Esri ArcGIS to power its suite of online mapping decision support tools, which organizations can use to prepare for and respond to storm surge and flood damage. The tools were used in the wake of Hurricane Sandy and the Deepwater Horizon oil spill in the Gulf of Mexico. Read the article. The Nature Conservancy works with communities in the US Virgin Islands to determine key assets that may be vulnerable to sea level rise and storms. Want to change the banner and text colors and header logo and links in your Map Tour Story Map? Here's how. To make cities livable and resilient, there needs to be a systems approach to planning and a movement to rebuild smarter, not just stronger, says Shannon McElvaney, Esri community development manager. Read his article. 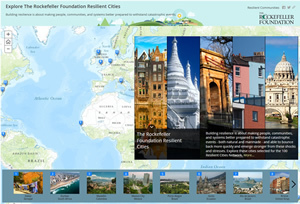 Urban Observatory returns to the Esri User Conference in July as an interactive exhibit with more cities and themes to explore. Read the article. A new version of the World Ocean Basemap gives you the ability to use your own annotation and labeling or layer your data between the base and reference layers. Read the article. Esri technology helps give the Port of Long Beach a common operating picture. In this video, Randy Parsons, the port's director of security, explains why a geospatial component is important in the system called Virtual Port. Brian Boulmay from BP talks about reducing redundancy and building one geospatial platform. Watch the video. The Esri Disaster Response Program Open Data Site contains data to download about US tornado reports and hail- and windstorms. My Esri, coming in July, will be a website where you can manage all aspects of your relationship with Esri in one place. Hear more from Esri's Nick Frunzi. This web map, which shows the path of a tornado in Arkansas and the number of people and businesses impacted, was created using open data and spatial analysis. Read the blog post and get a close look at the map. Executives from The Wendy's Company, Bank of America, and Chick-fil-A are among the speakers at the 2014 Esri Business Summit. Read this article to preview what they'll talk about. Register to attend, too. How can GIS help tackle education's grand challenges, from Common Core standards to online learning? Read this article to find out what issues educators will address when they gather July 12–15, 2014, for the Esri Education GIS Conference in San Diego, California. Join them! Create, analyze, and report on alternative planning scenarios using the new GeoPlanner for ArcGIS. This web app brings the power of geoscience to planning professionals, giving them the tools they need for their land-based planning workflows and geodesign projects. ArcGIS Pro, now in beta, gives GIS professionals the ability to work with geospatial information in both 2D and 3D. Read the blog post and watch this video. Plan to go to the Esri User Conference in July? Stop by the Training and Certification Island and enter your name to win a free Esri Technical Certification exam voucher. Learn to choose different symbols to represent the features you've added to your map in ArcGIS Online. You can now find ArcGIS solution symbols in a GitHub repository. Read the blog post for details. This set of templates will help you get started making your own disaster-related maps. ArcGIS Online now includes a way to mark items as favorites, helping you to quickly find and retrieve frequently used items such as maps and layers. Read this tip about how to use My Favorites. Familiarize yourself with the members of the 2014 World Cup team from the United States and their hometowns using this Story Map. The tournament in Brazil ends July 13. This latest update provides great detail for planning trips and making your way through the busy streets of Copenhagen. Read the blog post. What could your organization achieve if decision makers knew what was possible with enterprise GIS? Tell them about Exploring Enterprise GIS: A Workshop for Leaders. Take a virtual tour of the National Zoo and see where some of the youngest animals such as lions, tigers, and gazelles live. Another map shows where you can find the same animals in the wild. Many agencies use Esri technology to create online maps that show fire perimeter and evacuation shelter locations. View this map with information about last month's wildfires in San Diego County and this general wildfire public information map. Learn how spatial analysis can help you manage health services and support decision making in GIS Tutorial for Health, Fifth Edition. Electronic resources for self-study and course instruction are available, and it's ArcGIS 10.2 compatible. Buy the book.